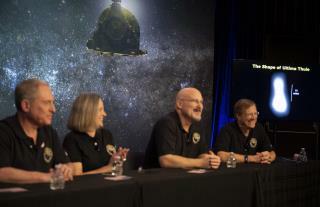 (Newser) – NASA's New Horizons spacecraft has survived the most distant exploration of another world, a tiny, icy object 4 billion miles away that looks to be shaped like a peanut or bowling pin. Word of success came 10 hours after the middle-of-the-night encounter, once flight controllers in Maryland received word from the spacecraft late Tuesday morning. Cheers erupted at Johns Hopkins University's Applied Physics Laboratory, home to Mission Control, as mission operations manager Alice Bowman declared: "We have a healthy spacecraft." New Horizons zoomed past the small celestial object known as Ultima Thule 3.5 years after its spectacular brush with Pluto; that was the most distant exploration until Tuesday, reports the AP. Scientists said it will take nearly two years for New Horizons to beam back all its observations of Ultima Thule. The spacecraft is believed to have come within 2,200 miles of it, and based on rudimentary pictures snapped just hundreds of thousands of miles before the 12:33am close approach, Ultima Thule is decidedly elongated—about 22 miles by 9 miles. Scientists say there are two possibilities: Ultima Thule is either one object with two connected lobes, sort of like a peanut still in the shell, or two objects orbiting surprisingly close to one another. A single body is more likely, they noted. An answer should be forthcoming Wednesday, once new and better pictures arrive. The best color close-ups, though, won't be available until later in January and February. New Horizons will continue to zoom farther away. The hope is that the mission, now totaling $800 million, will be extended yet again and another target will be forthcoming sometime in the 2020s. The New Horizons probe flew past Ultimate Thule at over 33,000 mph so far out that our sun is just a tiny dot and its illumination very, very dim. That NASA is still receiving data from it is really amazing but the spectacular results really ended with Pluto unless there are capabilities NASA hasn't told us about. What we need is more missions building on the capabilities and creativity of the scientists and engineers not only at NASA and JPL, but Space-X and Boeing too. Let's start with some more telescopes in space like Hubble and Kepler. "Two masses in a peanut shell" More Proof Accretion is FAKE Science.. Or maybe Evolution has turned Accretion Off for a while? ?..